Products purchased as NEW CONDITION directly from Avantis Power Sports of Colorado will be provided with a Limited Parts Warranty unless noted otherwise on the sales receipt. The entire product is warranted against factory defects in material for PARTS for a period of 30 calendar days from purchase. The ENGINE is warranted against factory defects in material for PARTS for a period of 30 calendar days from purchase. During “product” warranty period, Avantis Power Sports of Colorado will replace parts at no cost, and will charge a maximum of $30.00 labor for each repair made. This includes replacing the original battery, tuning of the carburetor, and other minor adjustments to performance. During “engine” warranty period, Avantis Power Sports of Colorado will replace defective parts at no cost, and will charge a maximum of $90.00 labor for each repair made. Carburetors, starters, spark plugs, and similar items that are mounted to, or within the engine refer to the “product” warranty period. Transmission belts and rollers along with brakes and brake pads, suspension, tires, and plastics are subject to rider abuse and are NOT covered by any warranty unless it is determined by Avantis Power Sports of Colorado that the product was defective from the factory. Warranties are void if owner does not follow suggested break-in instructions, maintenance procedures, has service performed by other than Avantis Power Sports of Colorado or has altered, damaged, or otherwise caused harm to the product. Warranty status is at the sole discretion of Avantis Power Sports of Colorado. Disclaimer: EXCEPT AS EXPRESSLY SET FORTH HEREIN, AVANTIS POWER SPORTS OF COLORADO MAKES NO REPRESENTATION OR WARRANTY OF ANY KIND, EXPRESS, IMPLIED OR STATUTORY, INCLUDING BUT NOT LIMITED TO WARRANTIES OF MERCHANTABILITY, FITNESS FOR A PARTICULAR PURPOSE, TITLE OR NON-INFRINGEMENT, OR WARRANTIES OR OBLIGATIONS ARISING FROM A COURSE OF DEALING, USAGE OR TRADE PRACTICE. 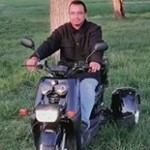 Limitation of Liability: IN NO EVENT WILL AVANTIS POWER SPORTS OF COLORDADO OR ITS AFFILIATES OR SUPPLIERS BE LIABLE FOR ANY LOSS OF USE, INCIDENTAL OR CONSEQUENTIAL DAMAGES OF ANY KIND REGARDLESS OF THE FORM OF ACTION, WHETHER IN CONTRACT, TORT (INCLUDING NEGLIGENCE), STRICT LIABILITY OR OTHERWISE. THE TOTAL CUMULATIVE LIABILITY TO CUSTOMER, FROM ALL CAUSES OF ACTION AND ALL THEORIES OF LIABILITY, WILL BE LIMITED TO AND WILL NOT EXCEED THE PURCHASE PRICE OF THE PRODUCT PAID BY CUSTOMER MINUS REASONABLE WEAR AND TEAR DEPRECIATION OVER A USEFUL LIFE OF THREE YEARS MAXIMUM. RIDERS OF POWER SPORTS PRODUCTS SHOULD MAKE THEMSELVES AWARE OF THE POTENTIAL DANGERS OF RIDING SUCH EQUIPMENT, SHOULD WEAR PROTECTIVE HELMETS, EYE PROTECTION AND CLOTHING, AND SHOULD TAKE AN APPROVED SAFETY COURSE FOR THE APPLICABLE PRODUCT PURCHASED. POWER SPORTS PRODUCTS ARE DESIGNED AND MANUFACTURED TO BE RIDDEN BY COMPETENT PERSONS OVER THE AGE OF SIXTEEN (16) YEARS OF AGE. 1.) Make sure to allow your new scooter to break-in properly. Never drive this vehicle over 25 m.p.h. for the first 300km. Excessive speed could cause engine failure. a.) Break-In procedures for the first 300 km include: No full throttle use. No passengers. Keep away from hills as much as possible and do not exceed 25 mph. 2.) NEVER put your scooter on its center stand and twist the throttle to the point that the rear wheel spins (also note that at idle your scooter’s rear wheel should not spin while on its center stand). ALSO do NOT ever twist the throttle while restraining the scooter with a brake or other force. This is very hard on the engine and transmission. 3.) Bring your scooter back for its first maintenance at 300km. The minimum service requirements at this time are engine oil change and transmission gear oil change. It is highly recommended that you have a complete break-in maintenance performed on the bike. NOTE: The break-in period of your engine is a critical time to take extra care of it and to perform these maintenance inspections. Most engine wear happens during this period and for that reason these services need to be taken care of in a timely manner. 4.) Check and adjust the brakes, throttle cable, tire pressure, and fasteners weekly before riding. This is in addition to the pre-ride checklist. 6.) Never add oil to the gasoline in your scooter. Your scooter uses a 4-stroke engine. c.) Do not mix oil with gas. e.) Do not re-fuel while engine is hot. Allow engine to cool before fueling. b.) Check cable for damage and replace if damage is present. c.) Check for contamination in throttle cable or housing. a.) Check that all axle nuts and lug nuts are secure. b.) Check for missing fasteners. Replace as necessary. c.) Check that all other fasteners are secure. Tighten if necessary. a.) Make sure steering turns freely. b.) Check for proper “toe-in” of wheels. a.) Check that clamp bar and connections are tight and corrosion-free. Clean/tighten as necessary. a.) Check for proper operation. Replace bulb as necessary. a.) Check that belt is loose and moves freely on the drive pulley. a.) Check that all guards that are covering rotating parts, including the clutch. b.) Tighten loose guards. Replace worn or damaged guards as necessary. 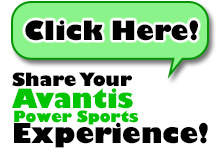 Avantis Power Sports of Colorado will take special orders if we do not have something in stock that you are looking for. There is no extra charge for doing so, however, there may be an additional fee for shipping. Normal delivery time for special ordered items is approximately 3 – 5 business days. However, this delivery time can fluctuate due to weather, holidays, or any other reason. Avantis Power Sports of Colorado does our best to provide you with the quickest turn around times possible, however, issues such as shipping are out of our control. Special orders also require a minimum of 50% down payment before unit will be ordered. Balance must be paid in full at time of delivery. DOWN PAYMENTS ARE NON-REFUNDABLE. ALL SALES ARE FINAL. Also, customer agrees that a time/date will be scheduled to promptly pick up the special ordered unit. If customer cannot pick up unit at specified time, they must contact Avantis Power Sports of Colorado immediately to make arrangements. If unit is not picked up on scheduled date/time, Avantis Power Sports of Colorado may apply storage fees until the unit is picked up.